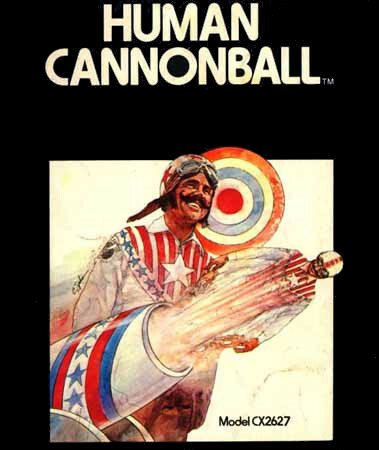 Human Cannonball and Cannon Man were rather obscure early games for the 2600. I guess the concept of 'calculate the angle' was a bit too dull for most gamers. While Atari decided to go with the sensible Human Cannonball moniker, Sears decided to try and make their version sound like a bad b-rate superhero (doesn't Cannon Man just sound like a bad 80's comic book?). Both games show a man being shot out of a cannon and a bulls eye in the background, but they go about in different ways. The guy on the Atari box looks like the guy from Bowling dressed up in an Evel Knievel outfit, while the guy on the Sears box is being shot straight up into the sky (wrong way guys!). Not only that, but it appears the Sears guy has to share his cannon with two other people (damn you cheap bastards!). 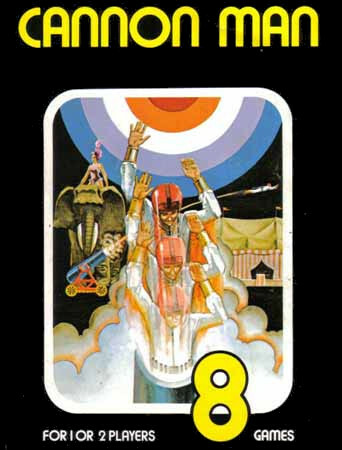 The Atari version shows way too much handlebar moustache for my tastes, and the Sears version has an elephant that appears to be ready to trample the cannon crushing our poor hero. I'll give the nod to Cannon Man just because it's probably the rarest Sears artwork out there and most people will never see it.